Our durable upholstery fabrics are pre-treated with Vectra Fabric Protectant to help stains from penetrating fabric. Can be conditioned using any type of leather lotion or protectant, but please be aware that such applications to leather typically darken its tone slightly. Again, read the instructions and warnings on your leather protectant bottle. This is an aspect of our handbag design that we GUARANTEE. If you ever have a problem with your frame that cannot be cured by these instructions, we will replace it for free. 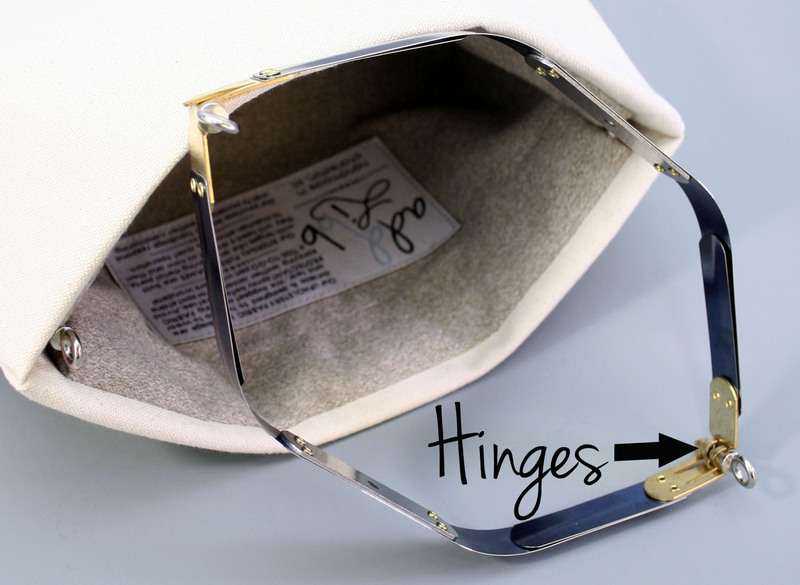 Our frames are constructed with spring open hinges in the two corners directly below where strap attaches. Like any two interactive pieces of metal, these corner hinges may need a drop of oil now and then to maintain smooth and quiet operation. You can access these frame hinges by opening the bag and looking into the corners where the straps attach, where the interior fabric parts. The three lines of brass toned metal is the hinge. Any kind of basic kitchen oil will do.